How to do braids? Want to style hair? You want to choose the right hairstyle for you? Hairstyles step by step for girls will help you to do all of these problems. Hairstyles step by step is a collection and tutorial of beautiful hairstyles for women. Best Hairstyles step by step is the top choice of many girls every day. 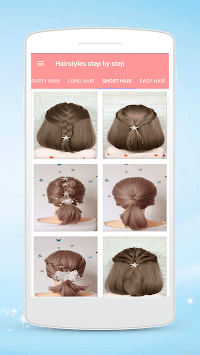 You just need to install the app, choose the hairstyle you want and follow the video hair tutorials easily and simply. 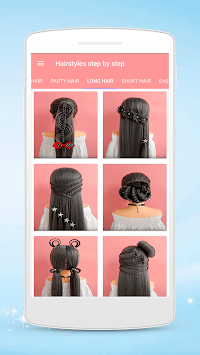 The application contains dozens of easy hairstyles with high quality photos, best video tutorials and the whole is free! All steps of hairstyle tutorials are made by professional hair stylists. You just need to choose the most fashionable and stylish hair styles for yourself. All hairstyle tutorials are FREE! No registration required, no internet required, no money required. Just install and use. - Work hairstyles: high buns, dutch braids, law buns. - Party hairstyles: hairstyles for wedding, birthday, holiday. - Different braids: simple braid, Russia braid, French braid. We wish you have cool hairstyles with Hairstyles app. Hairstyles step by step for girls- make beautiful the way you want!